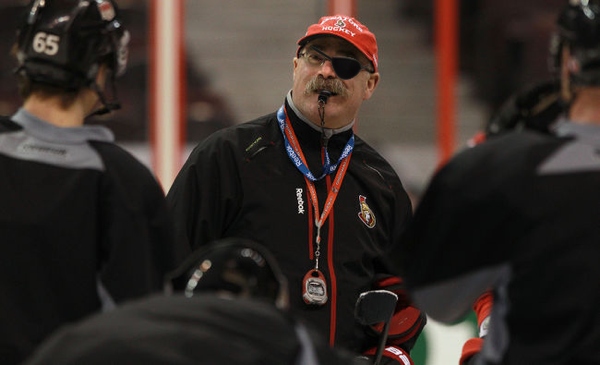 Paul MacLean's doppelgänger takes to the ice for his first practice as the head coach of the Senators. The Ottawa Senators once again surprised its fans and the media this morning by announcing the hiring of a new head coach: Paul MacLean’s lookalike. The news comes just days after announcing the dismissal of Jack Adams-winner Paul MacLean which left some fans reeling. It also seems as though the organization quickly realized that Dave Cameron was a huge mistake and they have reacted by hiring the doppelgänger of Jack-Adams-winner Paul MacLean. No longer relegated to sitting behind the bench, the MacLean twin is settling in to his new position: standing behind the bench. Many of the players are excited about the change and hope it will bring a new energy to the dressing room. Forward Erik Condra spoke with the media after today’s practice: "It's really exciting to have someone new out there on the ice with us, and it’s also great that he looks pretty much exactly like our old coach except he has a weird eye patch and smells like Ritz crackers." Defenceman Marc Methot was equally motivated after practice stating “It’s great. He just lets us skate around wherever we want." When asked about becoming an NHL head coach with literally no hockey experience other than sitting near the Senators bench a few games per season, the MacLean lookalike (whose real name is still unknown to everyone in the organization) commented that he has a lot to learn and he hopes that everyone can be patient with him. He continued to speak about what a large adjustment it is going to be, "Coming from the construction industry to the Ottawa Senators obviously meant a substantial pay cut for me, but when else are you going to get a chance to be the head coach of an NHL team? I’ve never been offered a job before solely because I have a certain configuration of facial hair." Asked about what kind of changes we should expect to see on the ice, "Although I learned a lot from Paul, I'll have to admit he had some major communication issues; I couldn't even hear him from behind the glass." When asked about the Senators' struggling power play, he said "I'm not too concerned about personnel when it comes to the power play. I'm just going to stick to what I did from behind the glass and yell 'SHOOT!' whenever we have the puck." The MacClone continued, "Paul famously relied too heavily on veteran coaching moves, like folding his arms and staring in to the distance, when everyone knows that to win in this league, you can't do it without a little flash. I think I can provide the occasional diving motion with my hands, or at the very least, I can do that thing where you step up on to the edge of the boards and frantically wave your arms at the officials. The players seem to respond to that." There was a bit of unrest with respect to what would happen to the now-vacant seat behind the Ottawa Senators bench where the MacClone used to sit. Ottawa Senators general manager Bryan Murray assured the media that they had a solution in place, "It’s been very short notice, but we've been able to secure a Cory Clouston lookalike that I think fans are going to get a big kick out of." When asked why the organization would go to the trouble of announcing that Dave Cameron was going to be taking over as head coach permanently and not in an interim position as many assumed, Murray simply stated, "I misspoke." And Dave Cameron was never seen or heard from again.